The sled dog racing titles program of the International Seppala Siberian Sleddog Club and the Continental Kennel Club is a program to identify and award outstanding purebred sleddogs. It is based upon a dog's lifetime racing record in races open to all purebred sled dogs registered with the Continental Kennel club and advertised to the general public. The four titles Sd, Ld, Xsd and Xld, as described above, will be recognized. A dog qualifies for an Sd or Ld provided he races on a team that finishes within 120% of the winner's time in 8 qualified races. The Ld title applies if, and only if, the dog was a leader in at least half (4) of the races. A dog qualifies for an Xsd or Xld provided he races on a team that finishes within 110% of the winner's time in 8 qualified races. The Xld title applies if, and only if, the dog was a leader in at least half (4) of the races. 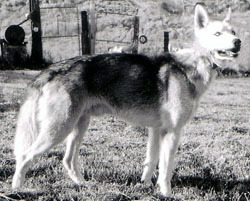 The Sd and Xsd titles, when used as a name suffix, should not be confused with the similar Siberian Husky Club of America titles, which are participatory in nature and are not demanding enough to reflect racing merit. A qualified race is any race open to all purebred teams, generally advertised, with a trail distance of at least 10 miles per heat, humanely constructed and with at least 4 finishers. The minimum trail distance requirement is imposed to preserve the Seppala Siberian Sleddog as a sled dog that can move rapidly over moderately long distances. the ISSSC is accredited, and www.seppalas.com is referenced. Thanks to Elsie Chadwick for the copies of many of the old photos.